This isn't some random throwback to a popular 1980's videogame. For the benefit of the uninformed, there really is such a thing! The Pacman Nebula is given it's nickname because of the shapes similarity to the videogame character. It's high up in the sky at the moment, in the constellation of Cassiopeia, and though visible all year for us in the UK, it really is in a great position during the Autumn evenings. Visually, NGC 281 is a tricky target to observe without plenty of aperture, though it is magnitude 7.0 or thereabouts. It's much further away than Andromeda, at around 9500 light years away, but as is often the case with nebulae, the more time you can spend collecting data, the more extent of the nebulae you will eventually be able to reveal. Taking on this target was a bit of an unknown for me, but what I was willing to do was put in the hours to get the data. Because of it's current position, there are quite a few images of the target appearing on various groups and forums around the internet, so it was easy to get an idea of what I should be able to get on a successful evening. In one of my astrophotography books, the description of how best to image the target assumes the use of a mono CCD camera and a combination of filters. Well, I don't have any of that. The 183c Hypercam is a One Shot Colour (OSC) CMOS camera. Fortunately, the book also suggested that capturing the data should also be possible using such a camera. So, I set about getting everything set up. In the forefront of my mind when I come to compiling the imaging run was the accidental mistake I made earlier in the week where I inadvertently left a smaller ROI on the Sharpcap settings which meant that I wasn't using the full size of the sensor chip. This time, I made sure I put that right. As I mentioned in part one of this double posting, I always like to try something new each time I go out. This time round, I wanted to attempt my longest imaging run to date. I read many forums and posts of people quoting that they have collected 10, 15 even 20 hours of data on a particular target. I'm not in the position to do that. I haven't learnt how to break my imaging runs up over several nights and still get everything to stack properly. That's another lesson for another night. But, I could collect 3 hours on a single run, plus calibration frames. There are plenty of things that need to happen simultaneously in order to have a successful imaging run, so the target for this particular night was to get a good clear run for 3 hours. You could be mistaken for thinking that once the whole process is started, you can just sit back and let everything happen. In truth, it's not far off, but you always need to keep an eye on the computer, the focus, the progress of the data capture, the dew, the power supply for the mount, the guiding and local nocturnal wildlife even! That's amongst a few other things. So, setting up the imaging run for 60 x 3 minute exposures and making sure that I had enough time to run off sufficient dark calibration frames after all the subframes were collected, I settled back and watched the data roll in. And here's the final image. I had two attempts at stacking. Once with the PixInsight software, and once with the DeepSkyStacker software. The latter produced the better stacked result, so that was the image I took forward to the rest of the processing steps in PixInsight. Notice the number of background stars in the image due to it's apparent position in the arms of the milky way! NGC 281 - The Pacman Nebula. See the bright star in the centre of the image which represents the eye of Pacman! The end of British Summer Time is really when Astro activities begin to ramp up for the winter. The opportunity to be observing or imaging within an hour or so of getting home after work makes the whole thing much more accessible. It's now possible to get a good 4 or 5 hours of time at the scope and still get to bed at a realistic time on a school night. But still, the opportunities need to be embraced when they present themselves. So, this passed week produced 2 clear nights with steady a steady sky, and the moon not putting in an appearance until the early hours. As I gain more experience at this imaging game, I'm learning to push my equipment further than I have before. Every session present a new lesson, and the first session of the week was no different. M32, the Andromeda Galaxy, is well positioned in the Autumn sky, high up above the surrounding rooftops. A very popular target, because it's big, and bright. Sometimes it's brightness can present it's own issues which I shall come to soon. I've imaged the galaxy several times over the last few years, but as my knowledge of processing in PixInsight and use of Sharpcap 3.2 increases, it's always a good target to revisit. I can compare my images to previous ones and it helps remind me about how my imaging is improving. 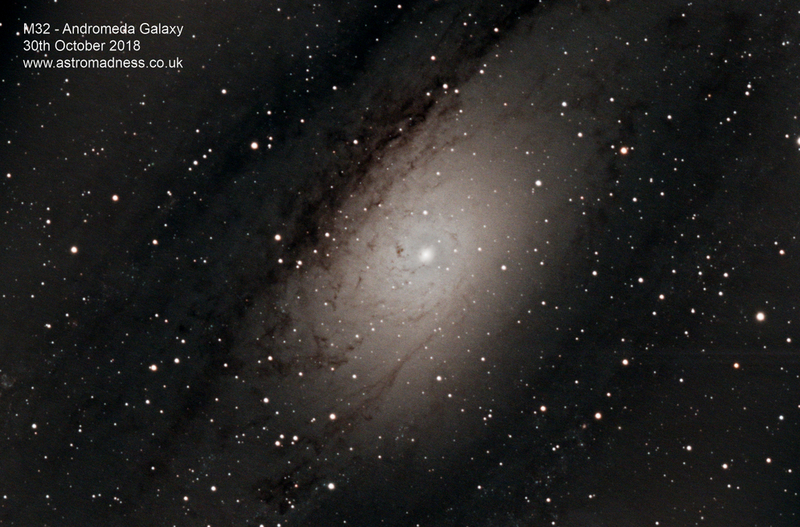 With the usual setup and alignment tasks carried out, I slewed the scope around to Andromeda and started the process of compiling the imaging run. All my imaging at the moment is carried out using Sharpcap 3.2. It's got lots of great features, but you don't have to know about all of them to get imaging. I've started with the basics of camera control (exposure length and gain), but make a point of learning a little bit more about it each time. Framing of your target is really important. Just as important as focus. In my passed images from a few years ago, framing was always a bit hit and miss. This time, I used Sharpcap to help get the core of the galaxy in the centre of the frame. To do this, I used the auto stretch function on the display image. It takes a single frame, stretches it to bring out the brighter parts of the target and allows you to then used the mount controls to gently nudge the centre of the target into frame. Used in conjunction with the crosshair reticule on the image screen, framing a target image becomes really easy. Quite simply, I can't believe that I hadn't come across this before! So, everything framed, focussed and gain and exposure settings set up, guiding enabled and running, I started the image run. I was aiming for 40 x 2 minutes exposures for the evening. That left me with plenty of time to run off some dark calibration frames before packing it all in. Around half way through the run, I noticed something on the Sharpcap software that I had not noticed before. I didn't want to stop the run and potentially waste the data I had collected so far, so I let the run complete. The previous session in which I imaged the Witches Broom Nebula, I started playing with binning. I run that session binning the data 2x2. It was successfully, and produced a pleasing image. However, what I didn't realise, was that when those image run settings were saved, removing the binning settings later returned to the normal 1x1 binning settings, but it also produced a smaller ROI scale, or, Region Of Interest. In effect, it allows you to use a smaller proportion of the cameras chip resulting in a smaller sized image for processing later. It's also very useful for imaging smaller targets like planets or small nebula. It was a big, but pleasant surprise when I managed to reveal this much detail in the core of the galaxy. To give a comparison, this is what the stacked, but unprocessed image looks like. Remember that this is what I get as a result of stacking all my light frames and then performing an initial stretch of the data. It also gives a good idea of what further processing steps achieve. M32 - Stacked and Unprocessed. In particular, the core is no longer a white blob, and individual stars and dust lanes can be resolved. The next time I image Andromeda, I'll be using the same settings, but ensure I'm shooting full frame images. I'll be chuffed to bits if I get this level of detail across the whole image. Definitely one for the to do list! That's Part 1 of this post done. 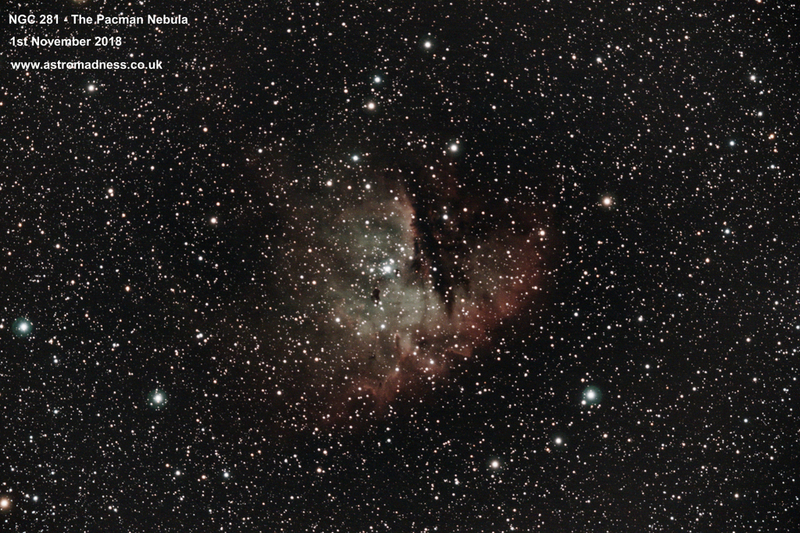 In the next part, I'll be looking at the results of the second clear night from last week. Until then, cheers!